News has come from Mexico about a huge music festival in March. Festival NRMAL 2013 features many worthy musicians, most notably Ariel Pink's Haunted Graffiti, Trash Talk, and the group Brujería, responsible for one of the most-banned record covers of all time. 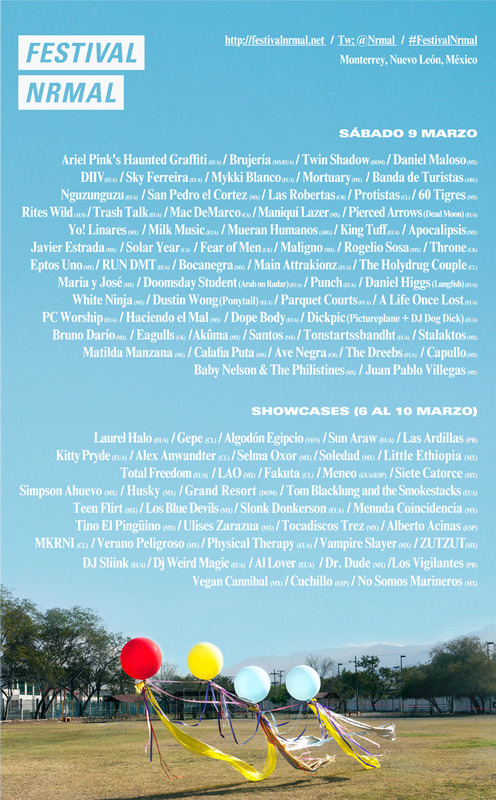 Festival NRMAL features over 55 international artists and takes place in Monterey, Mexico from March 6 to 10, but the main event is on Saturday, March 9, where there will be four outdoor stages. The people behind the festival urge us to look toward budget airlines like Volaris and VivaAerobus to get there, or to travel by bus economically. Tickets are available online via debit card, credit card, paypal, or any OXXO store. What are you waiting for?